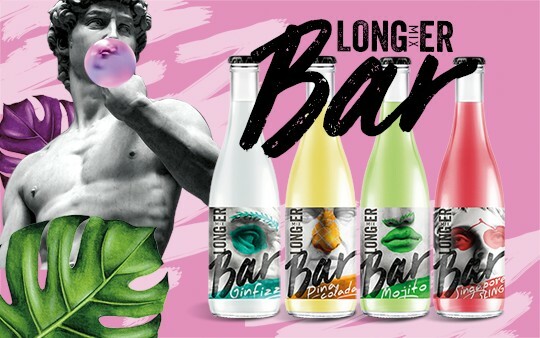 LONGmixER brand has congratulated everyone with the New Summer by issuing a new line of the classical carbonated cocktails under LONGmixER BAR brand in crafted design. Development of the modern European bar culture dictates its rules: The new venues are opened, offering the new concepts, tasty cocktails, pleasant atmosphere; the professional bartenders are trying to fascinate the guests with unusual uniquely designed combinations and extravagant serving. The popularity of the mixology and bar culture could not have fallen beyond attention when creating the new products. Therefore, LONGmixER brand has presented the new line of the classical carbonated cocktails under LONGmixER BAR brand. LONGmixER BAR series comprises the best classical cocktails treated as the most popular ones in the world, namely Mojito, Pina Colada, Gin Fizz, Singapore Sling. The taste of LONGmixER BAR cocktails is an ideal combination of the classical receipt and the modern bar interpretation, making an impression of a cocktail freshly mixed by the barmen for you personally at the bar. Carbonated nature of LONGmixER BAR, distinguishing the drinks from the core exotic LONGmixER line, renders a saturated taste to the drinks, ideally allaying summer thirst. The bright and unusual design of LONGmixER BAR cocktails follows the popular Pop-Art style, using images of the well-known ancient sculptures.